Playing to a very full room backstage, the band demonstrated a great deal of talent with a keen interest in presentation. Vocalist Denman Anderson delivered words and demeanor that matched the tone of the music, haunted but vibrant in the best tradition of a genre that embraces unhappy truths about life without throwing in the towel. Clad in a black suit and boots, Anderson cut a perfect figure for singing songs with titles like “Kingdom of Night” and “Bloody Hands.” By the second song of the evening, he easily hit his stride, enhancing the sleek and catchy synthlines of “Sever Me” with an appropriately dramatic flourish of the hands or a dancing sidestep. Alongside Anderson, Stephen Petix hammered away at an impressive set of analog synths. In the back of the stage, Katie Petix ably dove into a second set of synths and lent a softer backing vocal to some of the songs. From my vantage point, I unfortunately wasn’t able to see Katie behind a mound of speakers, but Steve played with such a high degree of frenetic energy that his performance recalled Todd Fink of The Faint, who never sits still behind his synthesizers. The resulting wall of synth was never overwhelming; to the contrary, the songs were melodic and energizing. Technophobia also deployed a set of video monitors positioned along the back of the stage that very effectively carried visual patterns that ebbed and pulsed with the synthesizers, giving the stage a glow that made it seem like it could be a set from Max Headroom. This seemingly small touch had a big impact. Opening act Lenorable actually has been around a bit longer than Technophobia, and the duo played an appealing set of shoegazey tunes. Singer Lisa Reed and guitarist Ian Graham play over a prerecorded electronic backing track, producing an airy, ethereal effect. Newer songs like “Disconnect,” the title track from their new EP, have an appealing low-fi accessibility. The guitar-driven Lenorable share a similar “goth”-tinged aesthetic with Technophobia and thus provided a seamlessly counterbalancing performance. I suspect we’ll see these two bands share the bill more in the future! 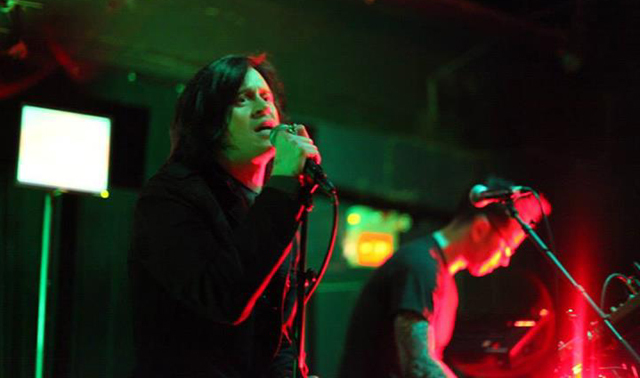 Meanwhile, Technophobia are out of the gate with ambitious plans that start with a second show at Ottobar on Sept. 5, opening for Cold Cave with Douglas McCarthy of Nitzer Ebb. As far as second shows go, it seems like the band was pretty quick to find a fit!